During the holiday season, family gatherings are more commonplace and yet older adults can experience more acute social isolation. Isolation is both a risk factor and a consequence of elder abuse. Older adults who are isolated are at greater risk of elder abuse, fraud, and scams. This is a great time to purposely connect with older adults. Get involved to help prevent elder abuse going into the holiday seasons. Read below for ways to get involved, resources, and more. Commit to connecting with an older adult in December. Share your experience to our Facebook page, and join the community of others #CounteringIsolation. Use the hashtag #counteringisolation so we can reshare it, too! We asked our community to share their experiences #CounteringIsolation. Here is what they shared. 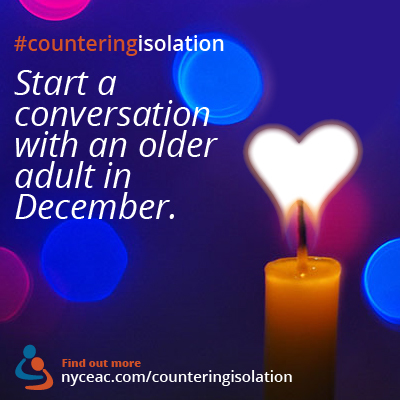 Share your #CounteringIsolation experiences in the comments below! Want to know more about #CounteringIsolation? We compiled helpful resources to help raise awareness of isolation in older adult populations. Feel free to share these resources in December as well. Have a resource to share? Share in the comments below. We’ll also re-share your resources to Facebook and Twitter. A great idea NYCEAC with a very important message to all. As we approach the festive season please don’t forget our older community. I hope this message spreads far. Will be sharing it here in Australia. Thank you so much, Maria! We appreciate your commitment to older adults and elder justice.